View More In Impact Wrenches. 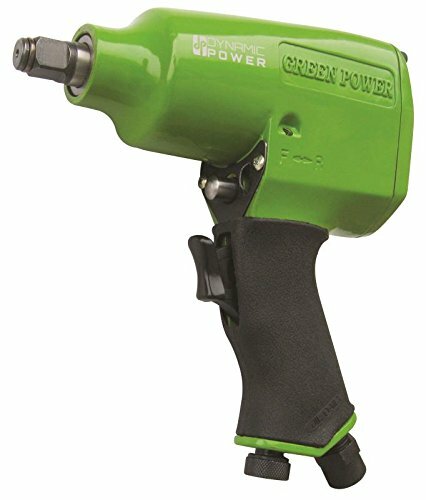 Dynamic Power 1/2" Air Impact Wrench (Rocking dog mechanism) is perfect for tire rotation, brake repairs, exhaust repairs, and the loosening or tightening of any other bolts.Hard hitting twin hammer provides reliability and high torque output.Bulit-in power regulator to control speed and torque. Single handed operation for forward and reverse direction changes. Has Four position power settings. At 240 ft-lb. of torque, provides power to remove most lug nuts. Save Most Live Best. We save your money in every step of our operation, with a guarantee of high-quality and reliability. We deliver the most saving and best value to you. Shop now with Dynamic Power and you will never worry about overpaying anything. Specifically designed for entry level DIY workers, Dynamic Power tools maximizes your saving by delivering quality tools with the LOWEST PRICES throughout the market. Befor using, please first read the instructions carefully; During using, please wear goggles, mask and ear muff; When connect air compressing tube, please comfirm the tools is closed. This tool should use spindle oil or sartorius( sew maching oil), do not use common or recycle , or components will be sestoryed. Recommended Hose Bore Size: 3/8"
Dynamic Power 1/2" Air Impact Wrench, Rocking dog mechanism.Has 4 position power setting. At 240 ft-lb. of torque, provides power to remove most lug nuts. Bulit-in power regulator to control speed and torque. Single handed operation for forward and reverse direction changes. Has Four position power settings. The sturdy composite design creates a long-lasting durable tool so you can complete job after job with confidence. This impact wrenches light weight, smooth twin-hammer mechanism, and ergonomic soft grip design work together to reduce vibration and fatigue so you can work longer with less wear on your hands. If you have any questions about this product by Dynamic Power, contact us by completing and submitting the form below. If you are looking for a specif part number, please include it with your message.